In “OpenOCD/CMSIS-DAP Debugging with Eclipse and without an IDE” I have documented how this works with the combination of GDB+OpenOCD+CMSIS-DAP, but this works in a similar way with Segger J-Link and P&E Multilink, as both come with a GDB server implementation too (e.g. if I use the Freescale Kinetis Design Studio or a DIY Eclipse IDE). The GDB client: this comes with the GNU tools, e.g. the GNU ARM Embedded (launchpad). The GDB server (e.g. from P&E or Segger). Both come installed with the Kinetis Design Studio. And a board :-). I use here the FRDM-KL25Z board as it works with P&E, Segger, and OpenOCD/CMSIS-DAP GDB servers. 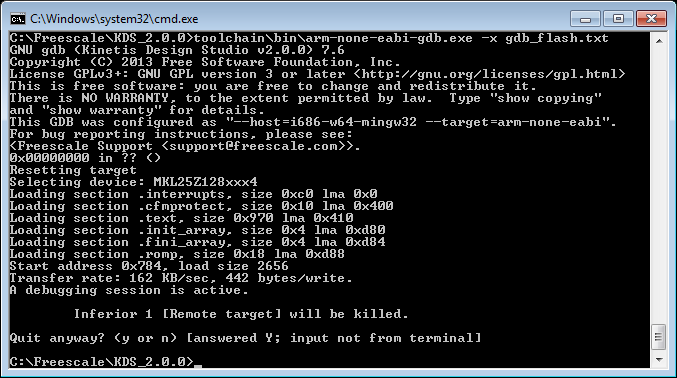 The client is the gdb executable (arm-none-eabi-gdb.exe) on the host. It talks over a TCP/IP connection/port to the GDB server. The server is usually an executable running on the same machine, but it can run anywhere in the network too on a remote machine. Popular GDB servers are available from Segger, P&E or as well as open source (e.g. OpenOCD, see “OpenOCD/CMSIS-DAP Debugging with Eclipse and without an IDE“). Kinetis Design Studio v2.0.0 comes with all these three servers. The server needs to talk to the microcontroller/device/board using a JTAG/SWD connection: this can be a probe from vendors like Segger (J-Link, for example), P&E (USB Multilink, for example) or with CMSIS-DAP (e.g. on the FRDM-KL25Z board, see https:\\www.freescale.com\opensda). 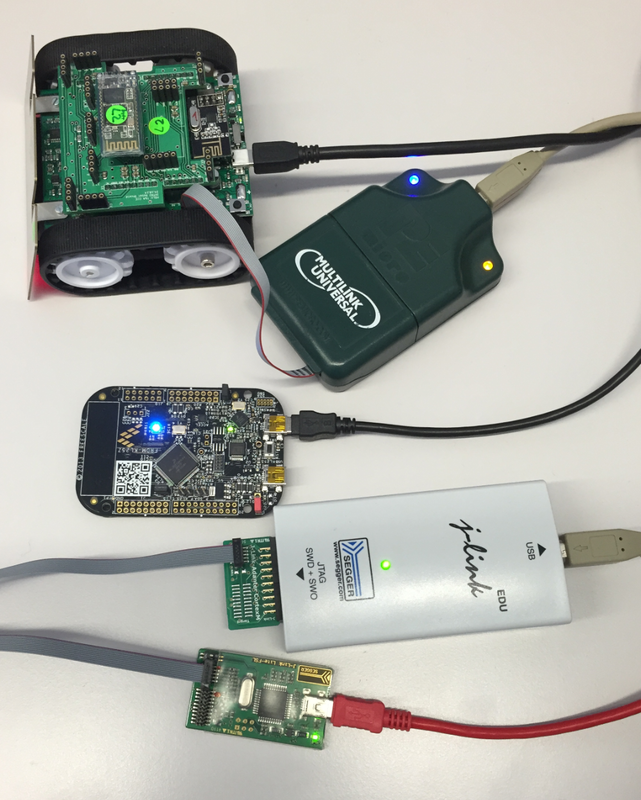 Both Segger and P&E provide firmware files for the FRDM boards to behave like a hardware probe, see “Segger J-Link Firmware for OpenSDAv2” and “New P&E OpenSDA Firmware v114“. The GDB client can be used with many GDB servers. The Segger and P&E specifics will be handled after this section. There is a GDB server from P&E available from http://www.pemicro.com/products/product_viewDetails.cfm?product_id=15320151. Alternatively, a P&E GDB server is included in the Freescale Kinetis Design Studio (KDS) (https://www.freescale.com/kds). PE-ERROR: Unable to auto-detect debug hardware. Please specify on the command-line. Halting. With this the server is running and waiting on port 7224 for a connection from the GDB client. There is a GDB server from Segger available from https://www.segger.com/jlink-gdb-server.html. Alternatively, a Segger GDB server is included in the Freescale Kinetis Design Studio (KDS) (https://www.freescale.com/kds). Segger has a GUI version (on Windows only, as far as I know) and a console/command line version. I’m using the command line version here. 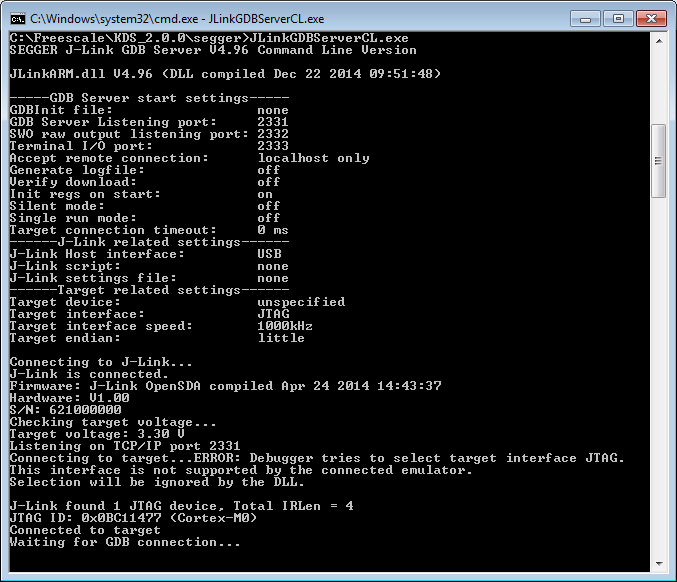 The Segger GDB server is named JLinkGDBServerCL.exe and located in the C:\Freescale\KDS_2.0.0\segger folder. 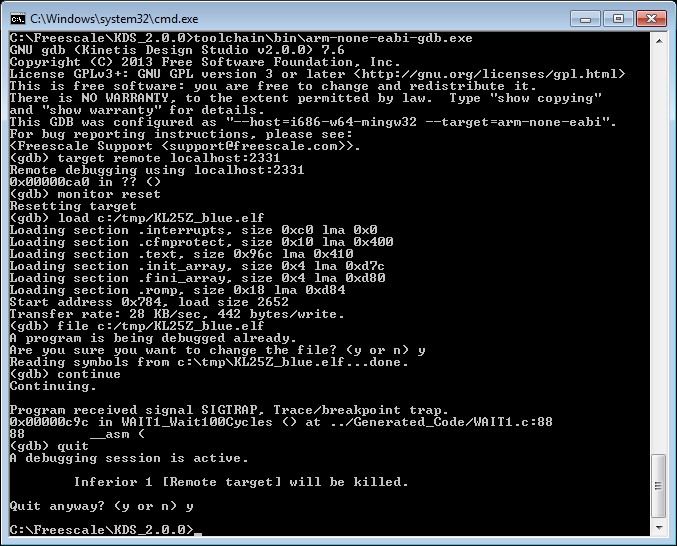 I can reset the target from the GDB client. The following commands in the gdb client are generic for both P&E and Segger. With CTRL+C I can stop execution. 💡 There are plenty of tips and trick for GDB available, see as well http://haifux.org/lectures/222/GDB_haifux_David_Khosid.pdf. For example you can put default commands into a .gdbinit file. Have as well a look https://sourceware.org/gdb/current/onlinedocs/gdb/ for a list of gdb commands. 💡 GDB uses a similar file named .gdbinit (if it exists) to be executed at gdb startup. So that would be a good place for common settings. Be free to write your own script: that way you can add the download to your make file or anything else which uses a command line interface. GDB comes with a nice command line interface, so no GUI or IDE is needed for debugging or just downloading/flashing an image to a device. The GNU tools come with a generic GDB client which needs to talk to a GDB server, which can be from P&E, Segger or something else like OpenOCD. The commands supported in the server differ from one GDB server to another. With little work, it is possible to setup a command line environment for programming and debugging which is very useful for automated testing or automation in general. This entry was posted in ARM, Boards, CPU's, Debugging, Embedded, Freescale, KL25Z Freedom Board, Tips & Tricks and tagged arm gcc, Debugging, Flashing, freedom board, Freescale, gnu gcc, KL25Z Freedom Board, P&E, Segger, Tips&Tricks, tool chains by Erich Styger. Bookmark the permalink. Do you know if it’s possible to download the contents of flash with the PEMicro tools? yes, and I have documented the steps/commands how to do this in this article here. Sorry, I meant the reverse, to get the flash contents from the MCU onto the computer. Any idea how to start excuting and then exit? Looking to use this for production and want to put this in a batch file. Currently when we execute “continue” we are stuck. that might depend on the server implementation. But ‘detach’ should do what you need. Or try ‘disconnect’? I’m using the P&E GDB Server in Kinetis Design Studio, and here when I do a ‘detach’, the target is started/running and it disconnects the gdb client. This is exactly what you need, right? Can you try ‘detach’ or ‘disconnect’? It could be dependent on the GDB server you are using. detach or disconnect will not work because we are still stuck in the “continue” part of the script. You rock. I was readying your latest article when you posted this. I will give this a try and let you know how it goes soon. Thanks for the details. I was searching for the way to run the commands from a file and here it is. Use ‘-x’. yes, the option -x let you execute an external script in a file. Thanks for sharing! Do you know if there is any way to use the eclipse variables in the GDB commands? I don’t think there is a way, at least not now. The problem is that the launch configuration has really not much knowledge about the eclipse variables at all. With ARM GNU Eclipse plugin and simply by putting GDB server commands in Startup tab in debug configuration, the GDB Server do the download job for you. I believe this might depend on the GDB server: which one did you use? Wow, very nice documentation. I was able to program MKE04Z8xxx4 MCU, using segger J-LInk and Linux, in less than 5 minutes. Very very clear explain. So, when i start to debug, it launches an error related to the selected remote port: “target-select remote localhost:7224”. What would it be? Problem solved updating kds pe micro plugin, as described on: “https://mcuoneclipse.com/2015/04/16/updated-pe-gdb-server-for-eclipse-connectattach-and-advanced-flash-programming/”. what should i do if i want to select the option “preserve partitioning of the device” in S32ds.exe using command line. I believe there is no option for this setting.